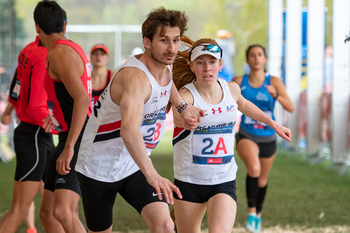 Smooth partnership work between Marta Kobecka and Jaroslaw Swiderski enabled Poland to win gold in the Mixed Relay at UIPM 2019 Pentathlon World Cup Sofia. The Polish duo fought off competition from higher-ranked athletes from Great Britain (Francesca Summers & Jamie Cooke) and Germany (Rebecca Langrehr & Marvin Dogue) to cross the line first on the last day of the competition. The medals may have remained in Europe in the end, but the increasing diversity at the top level of the Pentathlon community was highlighted with a bumper entry of 21 nations. Thailand took part for the first time along with four other Asian teams while Mexico, China and Guatemala all finished in the top six. It was a first taste of glory in a UIPM competition for 23-year-old Kobecka (POL), a Mixed Relay champion at the FISU 2018 World University Championships alongside Lukasz Gutkowski. Kobecka (POL) said: “I’m very surprised to win gold, but the Mixed Relay is a great event and I feel good doing this kind of competition. Great Britain were never far away from gold and in fact Summers (GBR) overtook Kobecka (POL) during the Laser Run before relinquishing the lead at the shooting range. Individual world champion Cooke (GBR) said: “It’s been good fun here with Frankie – we had a really good swim and then she carried me through the Fencing, we both had a good ride and then a good Laser Run too. “There has been a really good diversity of nations taking part in this Mixed Relay – we had a team from Thailand for the first time, and to have 21 entries was fantastic. “Competition is really strong in our team and the team spirit is strong, too. We are all aiming to do well in the European Championships in Bath, August 6-11 – see you there! Summers (GBR) added: “I’m really happy that all the hard training has paid off today and I’m looking forward to the rest of the season. Her partner, Dogue (GER), added: “It’s a very good feeling because before the Laser Run we were not expecting a medal. We were hoping to hold on to 5th place or maybe improve on that, so it’s very amazing. “There were many ups and downs today. I was swimming next to Jamie Cooke, the best swimmer, but it was a solid swim and we are both good fencers, but today was a struggle and we only had a 50/50 record. Two competing nations managed to break the 2min barrier in the pool. Korea (Kim Sunwoo & Kim Soengjin) were fastest with 1:58.33, ahead of Russia (Gulnaz Gubaydullina & Egor Gromadskii) in 1:59.97. An exceptional performance from Mexico lit up the Fencing area, with Tamara Vega teaming up effectively with Manuel Padilla, gold medallist from the Men’s Final on Saturday. Mexico (Vega/Padilla) scored 27V/13D and added two points in the Bonus Round, stealing a march on the four nations who managed 24V/16D. Poland (Kobecka/Swiderski) and Great Britain (Summers/Cooke) built the foundation of their success with a solid performance, while Korea (Kim/Kim) and Czech Republic (Eliska Pribylova & Ondrej Polivka) also scored 24V/16D. Poland (Kobecka/Swiderski) were top performers on horseback, with two clean rounds and a time of 96sec enabling them to come within six points of a perfect score of 300. Guatemala (Sofia Cabrera and Charles Fernandez) put themselves in contention with a score of 288 and Great Britain (Summers/Cooke) stayed there with 286. In contrast, Mexico (Vega/Padilla) surrendered their overall lead – and ultimately their podium prospects – with the concession of 38 penalties. The 9sec lead of Kobecka (POL) immediately came under threat from Summers (GBR), who made up time in the first shoot and then took the lead in the first 200m of the opening lap. With the men’s world champion waiting in the wings, Great Britain looked favourites for gold now but a 25sec shoot from Summers (GBR) at the second visit to the range allowed Kobecka (POL) to wrest back control and hand over a solid advantage to Swiderski (POL). 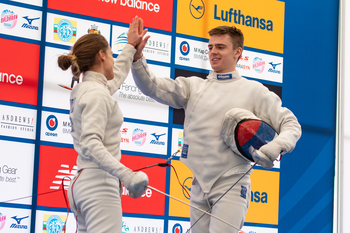 Cooke (GBR) may have fancied his chances of making up the deficit, but Swiderski (POL) exited the range in 14sec and the 2017 UIPM Pentathlon World Cup Final bronze medallist refused to give his rival any encouragement thereafter, winning by 9sec in the end. The battle for bronze was more intriguing, and it looked certain to be heading the way of Mexico after individual champion Padilla (MEX) raced clear of the pack at an early stage of the third lap. However, the laser range claimed another victim when Padilla (MEX) struggled with his second shoot, and it was at this point that Dogue (GER) seized his opportunity. Padilla (MEX) threatened to chase him down but he may have had tired legs after his exploits on Saturday, and Dogue (GER) held him at bay by 3sec. Behind them, China (Bian Yufei & Luo Shuai) grabbed 5th place as Luo (CHN) surged past Fernandez (GUA) on the line. 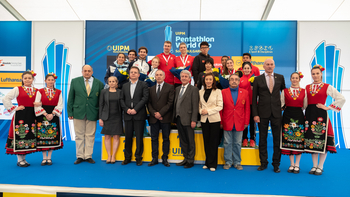 UIPM President Dr Klaus Schormann said: “We had 21 teams for the Mixed Relay here at Pentathlon World Cup Sofia and that is a super number for our movement. “We had a team from Turkey and a team from Thailand, so new federations are joining us in the Mixed Relay and we have seen a dramatic competition that the athletes really enjoyed. “You see a team spirit in the Mixed Relay that is something very special, and we are so happy because the nations want it and they support it. You can catch up on highlights from Pentathlon World Cup Sofia at UIPM TV and find results and reports at the UIPM website. 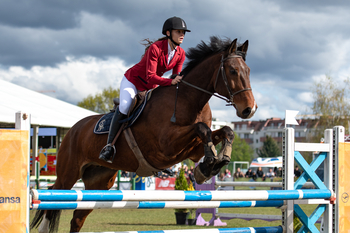 The next competition on the UIPM 2019 calendar will be Pentathlon World Cup Szekesfehervar from May 1-5, followed by Pentathlon World Cup Prague from May 22-27. Live stream of all finals is available on UIPM TV and the World Pentathlon Facebook page.